To create an environment which provides, respect, friendship, and a promise to never hurt one another, to offer guidance, to set and achieve goals, to help overcome personal challenges and to bring families together through Self-Defence. 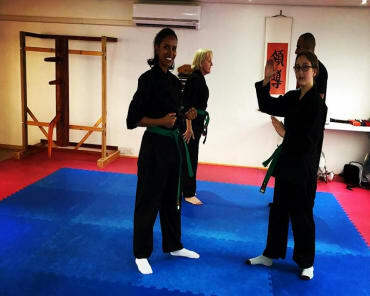 Body Mind Spirit WooShoo boasts a Purposeful Built, Full Time, Clean Private Martial Arts School. This gives BMS WooShoo the edge over every activity or sport, being available throughout the year and having the equipment to help students actualize their own unique potential. The only times BMS WooShoo is closed is Bank Holiday Mondays, Christmas & New Years, classes run through half term, and summer holidays. Just because schools are closed, doesn’t mean we are. In order for BMS WooShoo to help families accomplish their goals, our instructors have committed their careers to further their martial arts knowledge, focus on improving families martial arts experience and offering the best martial arts tuition available for everyone, this can only be done with Full-Time Instructors. The benefits of our full-time school and our full-time instructors allow BMS WooShoo to stay ahead of everyone else, rather than students attending class and hoping randomly one day everything comes together. BMS WooShoo only offer GOAL based programmes, this means our martial art programmes are focused on students accomplishing their goals. Time isn’t a factor! With the benefit of or Full Time Private Facilities, we can challenge our students in the right way, by being able to keep beginners, intermediates and advanced students separated, students are being challenged appropriately, it wouldn’t make sense to have white belts training with black belts. Rather than worrying about how many medals/trophies our school has, our only focus is on developing our students’ minds, and martial arts knowledge to allow them to comfortably attain a level they once thought never possible! BMS WooShoo Full-Time Commitments allow us to give students the perfect blend of instructing, students enjoy a mixture of 1-2-1 training with the instructors, group training and student to student training to help students learn and excel in a variety of methods. Combining all the benefits of above, Body Mind Spirit WooShoo is a lifestyle, not just another activity just to keep the family busy. Lifestyle changes which not only impacts the Body, but also their Mind and Spirit, encouraging a winning attitude that winners never quit and importantly an I can attitude!